Artwork Disclaimer: The featured artwork for this chapter is entitled Seraph Awakened and was created by Deviant Artist AiRen-SC. All rights belong to the artist, and the work is used graciously and with permission here. Author’s Note: I made a macro for this chapter’s quote quite a while after I wrote the chapter, mind you, but it was just too close to the source to not render a visual representation. Found here on my tumblr blog. Aeris screamed as she slid to the ground, feet scrambling wildly for purchase. Clawing at the black soil with ragged nails, she tried to turn and run, but Sephiroth was far swifter as he broke his stone’s pose, searing the air with his eyes. The face he wore now was only for killing. Empty save beauty and pale. It was what he’d been made for, his reason for being, and she was a task to be fulfilled. He slaughtered those men in the depths of the slums in order to get to me! To kill me in this world of shadow he surely calls his own. This was the trap. This was the turn. This was the betrayal. The Planet was not here to warn her and she’d fallen like a fool for this ploy. Oh dear friend, when I die in the darkness, will I find my way back to you? Or will my spirit wander this abyss and become a swirling shade? It was this terror that stilled Aeris’s struggles as she folded her hands to pray. At the sight of her defeat, he picked up speed and his eyes could’ve burned down world. If she blinked she’d miss her death again on the end of unyielding steel. He leapt through the air and her eyes streamed with tears as she waited for doom to descend. 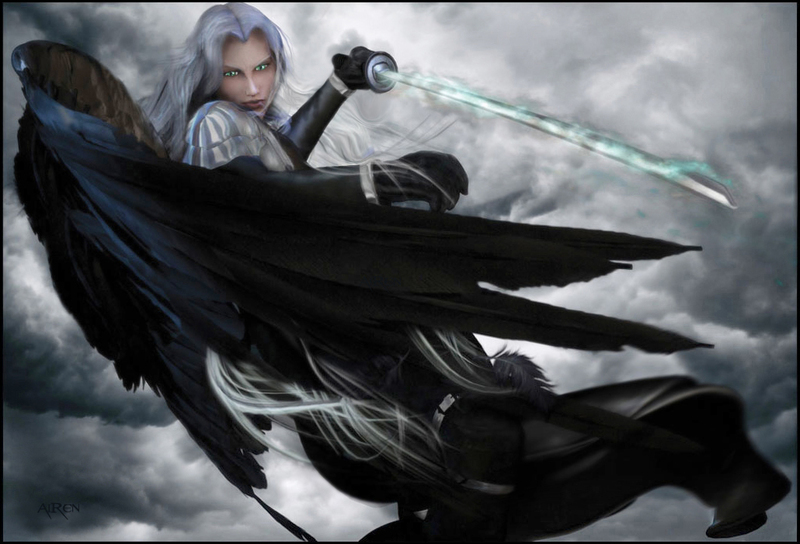 Over her he flew and that wing spread wide as Sephiroth turned the sword in his hand. The momentum from speed had him sliding with grace as the Masamune’s swift arc awoke roar. The…thing that had thrown him from her side gushed blood so black it steamed. Darker things spilled as he rolled to his feet avoiding the wash of entrails. Aeris turned her head to catch a mere glimpse of ageless horror that slunk through her mind. A moment longer would’ve lost her to soul rending madness, but she was saved as Sephiroth swept her up and slid back through the seams of the world. He stepped through the foam where the lonely sea made endless love to the shore. Wind-borne waves broke at his calves, but his boots were high and both they and his coat were thick and waterproof. The surf sloshed against as he walked through wet sands, which hushed softer than tears at his neck. Aeris clung there with her eyes tight shut, completely encased in his arms. The Masamune and monster were both back in between, the one writhing around the other. Sephiroth would never tell her that. She’d no need to envision that dance… The flower girl dug her hands beneath soft winter hair. She prayed and prayed and prayed again that this was not a dream. Damp sands left his prints for the next sweeping wave as a hard sob shook the small form. He stopped in his tracks and turned to view his little charge’s stricken face. Fear had drained her cheeks of color that not even tears could return, but she still raised her head and kissed her savior over and over again. Cheek, brow, and temple all were blessed by her salt stained lips, and Sephiroth shut his eyes for a moment unsure how to bear this pain. “I thought…I thought…” she sputtered and choked. “I know what you thought, little flower.” She’d fallen back against his neck, and he laid his own lips to her brow. Sephiroth shifted his eyes away to look up at the sun. The sky that attended was so blue by the water, it could’ve stolen its hue. “That may be, but it doesn’t negate the fact that the horror’s returned.” The sea breeze picked up and streamed his hair back as it ruffled the bow in her hair. “We will do nothing. You’ve already done too much.” He touched her face and shook his head, as the sandy hill crested up. “You lost your life. You lost your friends. You lost your very future…” Sephiroth jerked his face away, but Aeris had seen something there. “What is it?” She tried to turn him back, but it was like trying to move a statue. Covering her hand, he sighed to return, but those moments had gathered grief. She kissed him them and took the foul words to destroy them with her purity, and Sephiroth stopped for this could not be unanswered though the moment was far too brief. Aeris ran fingers through his long bangs so similar to her own. “So you’re not the only one who can go in between?” she asked to half-veiled emerald. Sephiroth sighed as he looked up at the wall that now loomed grey before. A part crumbling staircase narrowed his eyes, and he wondered what they’d find at the top. “Oh dear gods…” the flower maid whimpered, “I-I know that crack, but I never heard anything within. It was always been there even before w-when my mother was still alive. I never felt anything…” She let her mind open fully, and her dear friend murmured confused. The Planet hadn’t even seemed to notice her absence and only trilled nonsense when she tried to explain. It was as though she’d been taken out of time when Sephiroth had pulled her between. “I don’t think you’d be able to, little flower, now that I know what it’s from, but your friends would’ve heard it like I did, and they found a way to seek it out.” He bowed his head regretful though he wasn’t the direct cause of their deaths. “No Aeris, not from you.” She looked so hurt the agony was blinding as he forced Mako green from the sky. “Things like that…they never die. They will always be here, Aeris. Ever hungry and ever gnawing at the very heart of the world.” The Cetra shook so violently he cursed his direct tongue. The city at the top of the wall was quiet, and Sephiroth stepped slowly to look around. It was the off season, early spring, but still Costa del Sol owned its solace. Too many buildings were boarded up with wood that looked a hundred years old. The shore over the wall was even empty of those who preferred a cooler clime, and his sharp gaze caught a few broken chairs sticking out like white bones in the sand. The streets were covered in grains so blown from the shore with no sweepers to clear it, and through every window was only desertion with signs that hung crooked and warped. “It’s all so…empty.” Aeris’s sigh was lost in the shush of the sea. “I suppose my apocalypse was not good for business.” Sephiroth swept his gaze through the streets searching someplace for her to rest. Though he could be swift in the between he didn’t want to risk her again. If it had to be done, he’d return them to Kalm, and they’d figure it out in the morning. A taller building rose ahead, encroaching eve enhancing wane light. Sephiroth pushed the hair from his face as he approached to see sign unobscured. The doors were open, which saved him the trouble of having to kick them in. Though it had been finer in its heyday, the hotel wore its age like vintage. Yellow lit chandeliers hung on their cords like gilded acrobats from the high ceiling, and though the door disturbed grumbling dust, it fell unseen upon rose and cream carpet. Aeris jerked up to peer around, surprised Sephiroth had let him see. He’d shifted her easily to one arm to retrieve the card from his pocket, and the Cetra leaned against his epaulet with a little half-made smile. The clerk’s grin twinkled book-tired eyes. He rang the bell amongst the clutter so zealously the former general almost muted his ears. From a corner room a bellhop near sprinted, wringing his hands to keep them from shaking. At Sephiroth’s neon glare he stood stock still as if he were bound by the light. His outfit was silly and very old-fashioned, but it fit with the air of this place. The bellhop gave them a scurrying glance as Sephiroth tilted his head. He always wondered what people made of him when he wore his glamour. “Oh… you don’t have any luggage.” The man’s shoulders slumped. “Nothing that should trouble you.” Sephiroth indicated Aeris’s travel bag. The bellhop reached the first landing and turned to climb up the next set. “Well, it is the off season, but my grandmother told me that after the…incidents people craved luxury less.” He glanced over his shoulder to expressionless face as his guest quickly flicked his eyes down. The woman he was holding nodded to acknowledge with sadness enough for them both. “Where did they go?” Aeris asked. “The Whispers, miss. It’s just slightly south, but the wind and the climate are better.” He was trying to hide the fact he was winded after just two sets of stairs. His guest was carrying a maid in one arm and had not even broken a sweat. “It sounds quite sweet…” The flower maid smiled, and Sephiroth turned to catch her eye. Puffing up the next set of stairs, the bellhop flung open the door at the top. He caught his breath whilst thumbing through keys still flushed when he found the right one. The room straight before them was what he unlocked, pushing open the double doors. Sephiroth ducked below the lintel and stepped into rosy dusk. The bay window spanned the full length of the building and faced the west where the day died in joy. Aeris sat up to his measured smooth steps, while the city erupted in light. It was hard to remember how empty it was when the setting sun filled every shadow. The flower girl laid her head against flawless skin and hair that shamed brightest sea foam. The once general turned back toward their host. “This is more than acceptable. Thank you for bringing us here.” He retrieved a fifty gil note, and the bellhop’s breath stumbled in shock. Between thumb and forefinger he grasped the money rubbing its surface to prove it was true. “That’s no trouble,” Aeris said with a smile. “At one point we had too many options. Sometimes it’s nice to have too few.” Her grin widened as she saw her protector stiffen the mask on his face. Relief loosened the bellhop’s shoulders. “Good then, well I’ll be back …and I’ll make sure I knock when I am,” he added in afterthought. The door clicked closed and they were alone to bathe in the radiant light. Sephiroth carried Aeris closer to the window where the dusk unending did spill. She shut her eyes to the murmuring Planet, the song ever sung in her head. The flower girl wondered if he’d be able to hear if he delved into her mind. Not that he would do that now…unless perhaps I allowed. She turned to grief that had leaked through the mask though it could not disrupt the glory. His hair was awash in the colors of the dusk as emerald bright eyes cut through. She’d yet to see anything quell the gleam that should’ve set lashes afire. His one arm around her was just as steady as it been when he’d first swept her up. “Do you never tire?” the Cetra asked softly. “Not really, little one,” he replied. “I could hold you in my arms for days and run to the ends of the earth.” Sephiroth laid his brow to hers, as Aeris passed a hand through his hair. “In fact…in this moment I find myself never wanting to put you down. I hope that doesn’t frighten you, Aeris.” He wrapped his other arm the maid and sealed Mako behind shut lids. Sephiroth shook his head before kissing her brow. Her sincerity was unreal. “It’s funny. Cloud was right about that…” She expected the stiffness as she laid her cheek so smooth alongside his. “Right about what, little flower?” The words measured themselves like a stingy cook. “I see you’ve been thinking about former suitors.” Amusement mixed with pain in his voice. He envied how she could slip through the past with protection from horror and grief. “That’s quite a leap, don’t you think, little flower, from puppies to generals?” Sephiroth pulled her closer so that their brows touched and her fingers slipped between his own. He kissed her anyway so the subtle words of hatred were swept away by this tide. The sun relented to starlight, which gave day its last respect to sprinkle the firmament from afar. What street lamps ignited could shake neither this light nor the one by the window side. Sephiroth slanted his mouth hard over hers to slake unquenched thirst, and Aeris made a soft, little sound, sliding slim fingers through silver. Silk brighter than moon washed over her skin in envy to pulsing starlight, and he answered that with a tug to her ribbon so chestnut cascaded down. With one hand he gathered enough locks together to tilt her head farther back. Exposing a creamy throat to his mouth as she dug fingers into his hair, but Sephiroth refused to go past this boundary and lifted again for a kiss that asked for entry before claiming her so slow. Aeris flung her arms around his neck, as he found the side of hers again. A little cry that held no pain heralded the slight press of teeth, and the low chuckle teased her reddening ears as she pulled back to meet his brow. “I can’t…” She fought for sweet stolen breath. “…think of anything else when you’re kissing me. Not horror, not dark…not even the Planet.” She blushed as it laughed in her ears. He tossed his hair and she shut her eyes as it swept sweet over her skin, but his face lowered in grief brought it to her own as Aeris laid a hand to his cheek. He kissed her before the shudder could form, and Aeris proved her words in that moment. The darkness all faded as she shut her eyes to afterimage of silver light. When they finally parted, Sephiroth sighed to reluctantly set the flower maid down. She half fell upon the window ledge for her heart was still drawn in the kissing dance and couldn’t fathom how to power aught else. The little Cetra’s head was thrown back against the wall with the memory of lips on her skin. There was no chance now of keeping her feet to accomplish such a task. There was black dirt beneath her nails, and that soured a bit of her reverie, but still Aeris managed to wave a hand, which he caught as he crouched before. Aeris made herself see the babes in the slums huddled together for warmth. Though she had no power to sidestep, the Planet could offer her sight of what it bore on its face. There were fewer urchins this new nightfall, and she shed tears for the missing’s fate. Her mother’s house was lonely, but it still stood intact. Even now with knowledge neither she nor the Planet could sense the evil below. This troubled her so she moved her mind to the peace of her church. In the red ruled night, it was still a haven, and the bloody glow could never dim that. Bittersweet tinged the back of her throat for amongst grimness there was always that light. The flowers within still grew in droves though they missed their mistress’s touch. Will I ever see you again? she wondered with fluttering heart. Though I could grow others elsewhere, you were my hope and my joy. You showed me light could blossom from darkness in this and the last life. “No, I’ll tell you.” She climbed down to stand before him, and his light alone broke the dark. “You will?” he whispered, shaking silver aside. “Not for me, little one.” He soft threaded their fingers. “Especially for you,” she declared. “You’ve been denied that for far too long.” She laid her head to his chest, and he held her closer with his free right hand. Aeris shut her eyes with a smile, her cheek to his skin, as Sephiroth stared unblinking down. She tilted her face up to meet his gaze with no fear for sliver split light. “I love the way you look up at me, Aeris.” The words broke through his layered wall. She wet her lips and he fought to maintain a semblance of his mask. “Mostly?” he questioned hearing the shadow that lay beneath her words. He bent down low to taste this truth from her giving lips, and in the midst of this, the bellhop returned with a gentle knock on the door. Sephiroth lifted and turned his head, calling out, “Come in.” The doors were flung open and the man fumbled in dragging a cart laden with platters. Aeris sighed as her protector swept over to hold the door for their host. “Thanks again, sir,” the bellhop huffed. “You’re really far too kind.” Sephiroth kept his silence at that. As if now noticing darkness, he snapped his fingers to bring the room to light. Chandeliers similar to the vintage lobby hung in grace above, and the man was too busy managing his burden to notice that small bit of magic. Aeris blinked and whirled around finally noticing their environs. A massive king sized bed stood as the centerpiece of the room. Complete with four posters and shimmering veils, the Cetra couldn’t help but blush. In the far corner near the huge bay window stood a mini bar, and the wall behind the bed was only a divider that stretched as wide as the headboard. Behind this was another full room with an antique dining table. This was where the bellhop headed with his clattering, rickety foe. “I thought there was no elevator,” Sephiroth said as the man dressed and set the table. “Well, there’s a dumb waiter,” he admitted, shuffling trays from cart to wood. “Not that I can fit in there, mind you, but it does make room service easier.” Grinning despite the blank expression, he brushed off his hands with a sigh. “Well there you go.” He gave Aeris a nod. “When you’re done just leave everything here and I’ll be along to collect it.” He touched his cap and refused more money before leaving them again to themselves. Even after that they could hear him whistling as he walked back down the stairs. He turned back and she was sitting at the table, head tilted up towards him. He nodded while Aeris softly sighed and gestured to the seat across. Sephiroth took it and almost half-smiled at the strange tides of fate. In lives before he’d given the orders with no question that they’d be obeyed, but with a mere motion of her tiny hand, she’d commanded the great general. “Well,” she considered, “he did make an effort to bring them along.” She swung her legs beneath the high chair and her smile could’ve made the spark. Sephiroth crooked two fingers up and flames burst from purple wax. Her cheeks were flushed a seashell pink that bled down to her lips, and the once general turned his head to the shadows shutting bright eyes to not light his pain. Sephiroth searched her face full of innocent anger that he’d slander himself in this way. Then he lifted away the top of the platter to reveal their evening meal. Sea bass and scallops ingeniously paired with watercress and squash. “Oh, I’ve never had this before!” Aeris almost squealed clapping her hands in delight. Her protector shook his head at her ire given way to exuberance. “Now are you going to eat?” she almost accused. “A little.” And this time he did smile. There was wine like black velvet so he poured her a glass and as an afterthought one for himself. The candles flickered as Aeris tasted what the sea had to offer. It was different, but seasoned well so savory blended with salt. The wine was more bitter so she stuck out her tongue as he laughed before pouring her tea. “You can ask me anything, little flower.” He sipped slow at his glass that sparkled in the flames to reveal a ruby heart. The candles danced soft in summer green as she licked chamomile from her lips. Suddenly shy and he cocked his head to the side wondering what had paused her query. “How many times do I have to tell you, little one? Never apologize to a monster.” He stared at the broken cup couched in his hand and quickly drained the rest. “About as many times as I must tell you that you’re not a monster.” Her hands were pressed on either side of her plate as the flower girl leaned slightly forward. “I guess I could apologize for apologizing, but that would be even worse.” He parted his lips to her smile, laid down the glass and caught her hand. One lost drop spilled on the white cloth, and he turned away from remembered blood. 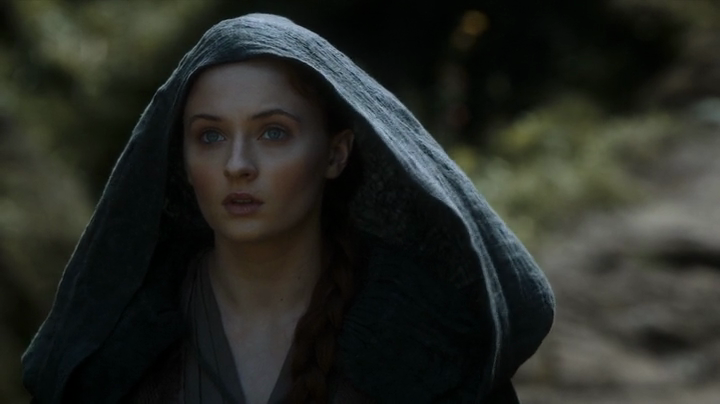 She let her hair cloak her face so that she could look up behind. He’d said she was genuine, but she could scarcely believe her thoughts were so easy to read. “It won’t affect me nor anything I’m touching, which is why my clothes remained intact. That would’ve been quite awkward.” He only smiled because her blush would’ve lit the night sky. With all my heart, she wanted to say, but could only glance up to assure. He took her hand and kept a firm but gentle grip on delicate fingers. Pulling it forward, he felt her resistance and immediately stopped. Looking over, he saw her bottom lip worried between her teeth. “No, no, it’s not that. I-I do. I really want to know. Please continue, but thank you for stopping…when you felt that I was scared.” He nodded while barely holding the mask. She did wince slightly in hot expectation, but felt only a cool buzz on her hand. It made no sense that his skin was warmer when its hue could shame new snow. Her soft palm was above the candle where the lick of the tongue was the worst. Slowly he lowered always watching for any hint that his powers were failed, but she only held awe and that something else that brought his heart sweetest pain. Leaving the candle to flicker in spite, Sephiroth examined her palm. He ran a long finger soft up the center as she shuddered and held back a gasp. “Are you hurt, Aeris?” He snapped his head up, but it wasn’t pain on her face. His lids half lowered to the smolder of jade as he started now at her forearm. “Please…” she whispered and his lashes wove green as he kissed fingers, palm, and wrist. “Your touch is like feathers backed by steel and you wear your beauty like a halo.” She wasn’t drunk from those few sips of wine, but still her mind felt muddled. The Planet pulsed softly a comforting song that promised her all was well. Her eyes squeezed closed as she concentrated hard on not biting through her lip. Even duel firelight flickered high could never rival his own. She looked up to the bright hot emerald while his thumb now stroked her palm. “I’m not so sure about that,” Aeris whispered laying her hand over his own. He stopped his soft torture to hold hand to hand over the remnants of dinner. “So you’re saying if you commanded me that I wouldn’t obey?” It was a shy little smile that would’ve been coy if worn by any other. In the little Cetra’s heart the Planet thrummed slow as it whispered Go to him, child. She stood without hesitation, trailing her fingers along the table as she walked. Thorn thin pupils followed her motion, the innocent sway of her step, but he half-veiled his eyes in quiet surprise when she climbed onto his lap. Around her as always he circled his arms to pull the flower girl close, and Aeris breathed deep where the smell of leather mixed with winter skin. “Why did you obey me, little one?” he asked. “You…enjoy feeling safe and protected,” he tried again to rationalize. “You’re not going to let me hate myself, are you?” he whispered down in awe. For just an instant hope gleamed softly in the corner of Mako eyes, and just as quickly the dark past crushed it, but he could not forget it had bloomed. Aeris gazed up and wet her lips, and he knew what she was expecting, but it was difficult enough to ignore her warmth as he desperately searched for distraction. On the tray by the side a small platter glistened, weeping as though sad to be ignored. Sephiroth cupped it like a brandy glass, slightly distracted from his desire. He registered the cold against his palm, though it didn’t dim his heat. Placing the platter down, he lifted the lid wondering what else their host had brought. Inside was a creamy delicacy slightly melted with rounded tops like furrowed snow. The flower girl gasped with both hands to her mouth, and Sephiroth looked down at her oddly. “What is it, Aeris?” He cocked his head to the side, looking between her and the strange desert. The Cetra grabbed his hand and smiled wide to the apples of her cheeks. “Don’t tell me you don’t know what this is!” Sephiroth raised a brow with a slight shake of his head. “Somehow I doubt that, little flower,” he murmured while thumbing her open lips. He took one of the spoons and scooped some of it up, cool vanilla to sweat between flames. To Aeris’s surprise he brought it to her, but she wouldn’t refuse the offer. Shutting her eyes she cleaned the spoon, before the kiss caught her from above. He glided his tongue along her own to not miss an ounce of taste. This moment battled the dark past behind as he covered her cheek with his palm. Sephiroth swallowed the cold from her tongue and lips until they warmed beneath his mouth, tilting up her chin he nibbled the remnants as Aeris remembered how to breathe. “Little flower,” he murmured, “you may just be right, but I need another taste to know.” Her lips were half parted as she leaned against him no strength in her now to sit up, but she took the chilled offering, holding half in her mouth as he bent to her again. Slowly he spun his tongue against hers as the borrowed sweetness filled them both. He buried a hand beneath her soft hair so he could reach deeper within. The soft moan from her throat pierced through memory as her fingers spun around his long bangs. Running the tip of his tongue over her lips, Sephiroth lifted his head so trailing silver licked soft over her skin. “Let me have a taste,” Aeris whispered and she took the spoon this time. He half smiled as she lifted it high, but allowed sweet frost coat his tongue. Then she reached up to throw her arms around his neck as he lowered his brow to hers. She pressed her rouged lips hard to his, and Sephiroth answered her full. Sliding his hands between her shoulder blades, he awoke a tremor at his touch. Ever cautiously his hands traveled downward to circle her waist, while Aeris slid fingers through his always smooth hair, the sweetness still staining their tongues. Each bite of the treat yielding this higher taste that was too delicious to swallow, and by the time it was done, jade seared through the dim left by the now crackling candles. He slanted his mouth over hers just to be sure no remnants of ice cream remained, kissing her so incredibly gently yet with such power it brought her to tears. Then he rose with the flower maid in his arms and only one thought in his mind. When the bed came to his view Sephiroth stilled in stark shock. Aeris was kissing his brow and cheeks as his eyes seared that canopied king. He turned to her with lowered head as her soft lips pressed to his. “I’m sure you’ll want to shower now,” he reminded the flower girl. She blinked confused at his sudden chagrin for that had long been forgotten. Sephiroth slowly put her down trailing his hands along her waist, and Aeris looked still back and up with wonder on her face for his height. “I really do love looking up at you,” she said, “and I love feeling safe in your arms.” He had to honor her words by wrapping her in them as she shut her eyes to utter bliss. “Alright…” Aeris patted his hand and he let her go, though only she sighed for the loss. The once general dimmed his hearing for the water’s soft flow, but he could still hear her singing. Chestnut hair would be plastered to her pale thighs as soap trickled between her breasts… He whirled to return to the dining room, narrowing eyes on the broken wine cup. Finding a paper pad and pen, he wrote, I broke a wineglass. Please accept my regret and take the portion out of the bill. Sticking it on the table as her voice rose in crescendo to an obviously well known song. Sephiroth shook his hair out of his face and returned to the main room. Stars painted the huge bay window as if begging to be allowed in. He opened it to a welcoming breeze though it didn’t stir the heat from his face. Her travel bag was sitting near the bed and Sephiroth remembered her book. He could read to her again, an enjoyable act with a far less dangerous ending. Opening the satchel, he peered within, and emerald froze at flash of pink. It was wrapped in clear plastic and still bore her old blood, which was as faded as the fabric. He held it up to his eyes and saw the great rent that had torn all the way through. Why would she bring this? Why bear this pain? She could’ve left this memory in Midgar. He did not tremble for he was too strong, but a shock to his neck would hurt less. This memory is for her. It’s not for me. I shouldn’t have looked through her bag. He put the dress back as it had been before and sat on the ledge to wait. Aeris’s skin was pinkened by heat as her hair was dried by the same. Her nightdress covered her, but he could imagine the perfection that lay beneath. She looked troubled for a moment til she caught sight of his darkness near the window side. The little maid hurried over and clutched his hands, and Sephiroth stood up as she pulled. Bemused as she led him to the bed and sat beside him there. Aeris leaned against his arm and ran her fingers through silver light. The breeze from the sea blew salt scented night to tangle their bangs together. He bent down to kiss the top of her head where the smell of damp summer still clung. The Cetra shut her eyes as he shook his hair back and it swept across her cheeks. He cocked his head at that. “Tell me about it…” Her voice had grown small as if asking for the shyest secret. “You are elite, little flower.” He softly squeezed her hands. “Was it really that terrible?” Her face was stricken and he gently laid a hand to her cheek. “I was always afraid of that…” she whispered as her dear friend soothed her mind. Sephiroth tilted her chin to his gaze and emerald full seared her face. “No, Aeris, I wouldn’t look twice. At first glimpse I would be caught.” He bent forward and kissed her brow, hiding the memory of what he’d been told. They’ll say you’re beautiful. They’ll want your attention, but they will never love you. I wouldn’t learn why until much later, but by then my soul was lost. Beauty isn’t for you and neither is love. No one could love a monster. Your own mother fled from your sight. He kissed her cheek as his hair stroked her skin, a sensuous whisper on her throat. The Cetra gasped and he only didn’t smile because memory weighed him down. “You let the dark in,” she whispered, “because you believed it was special, but now…” She just smiled and even in Mako light it was the purest thing he’d ever seen. Aeris almost didn’t get her hands free in time to cover up the yawn, and the clock on the night stand revealed the late hour and guilt cloaked him for keeping her awake. The flower girl leaned against Sephiroth’s side, and he just couldn’t leave her yet. Wrapping the small maid in his arms, the former general scooped her up as he stood. A humming sigh was his reward as she full sank against his chest. Cradling her in one arm, he pulled back the bed clothes and went to lay Aeris down. Before her could slim arms stirred to slide around his neck. Sephiroth couldn’t see her expression, but could imagine how she clung with stubbornness far surpassing her strength. She shook soft chestnut waves away, and Sephiroth slowly blinked. “If that’s what you wish, little flower,” he murmured. He laid her down and stood above for long moments. The joke had to be hidden somewhere in her face, but Aeris was as genuine as ever before so he climbed in by her side. Slipping one arm beneath and the other above, he pulled her back into him warmth. “Is this alright, little one?” he questioned looking down in some concern. Sephiroth carefully tightened his grip, and Aeris laid her palms on his arms smiling in joy he couldn’t fathom. Jade light burned through half-veiled lids as she wriggled herself even closer. He wanted her more than godhood and glory, though he’d never wanted those things, but then he looked at his hands, his bloodstained hands, and knew it could never be. Lifting one up he snapped his fingers and all lights but the stars went out. “I know…I should.” But she turned to kiss him instead. Green fire roiled between his lashes as her mouth slanted over his, and as before he led the dance after she began it. Aeris ran fingers through sea foam smooth hair as his hands locked at the small of her back. She gave a squeak as his mouth found her neck and he rolled himself above her. Pinning her wrists above her head with one hand, he bathed her in Mako light. Her lips were parted and blushing from kiss, her eyes shut as she waited for more, but Sephiroth froze like his skin’s flawless marble for what was revealed before. The buttons of her night dress had parted from embrace with only two still holding. They were at her breast, but it was enough for him to see the flower girl wore no bra. Below that in splendor for his unblinking view was her exposed and minute waist. It flared out to welcome wider hip, and he thanked whatever gods would listen that she wore underwear. I shouldn’t be looking, he thought in guilt, but couldn’t bring himself to turn away. I shouldn’t be allowed to be anywhere near this perfect, innocent rose. 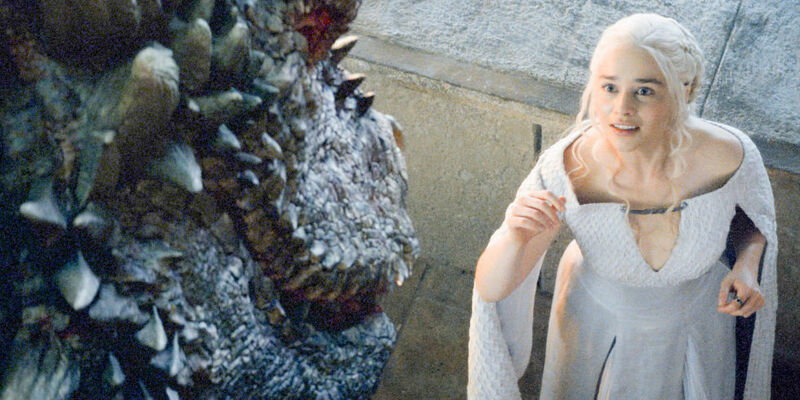 “Little one…” he whispered and she smiled up through silver hair fallen like snow. He released her wrists and indicated her bareness. “Oh!” Aeris gasped and he saw now her blush went much farther down than her face. She went to cover herself ‘til she saw gleaming green and her reflection in their light. Sephiroth slipped back to his side, but in his eyes she did remain. Aeris laid a soft palm over his hand and to his surprise took his wrist in her grasp. Her let her lift it and slivers tracked the motion of her placing it on her waist. Never was there smoother skin that lay beneath his palm, and the former general pulled her close, sliding his hand to the small of her back. Aeris answered his grief with hope shining in her summer eyes. She reached up to bestow one final kiss before nestling herself against his chest, asleep long before the first flash of white melted in emerald green. Author’s Note: So this turned into another fluffy chapter after all. Next Friday May 29 will see Chapter 10 – A Heart Made for War, which heralds one of my favorite if not my favorite parts, though I do bear a bit of guilt for that. As usual thank you all so much for your likes and support!